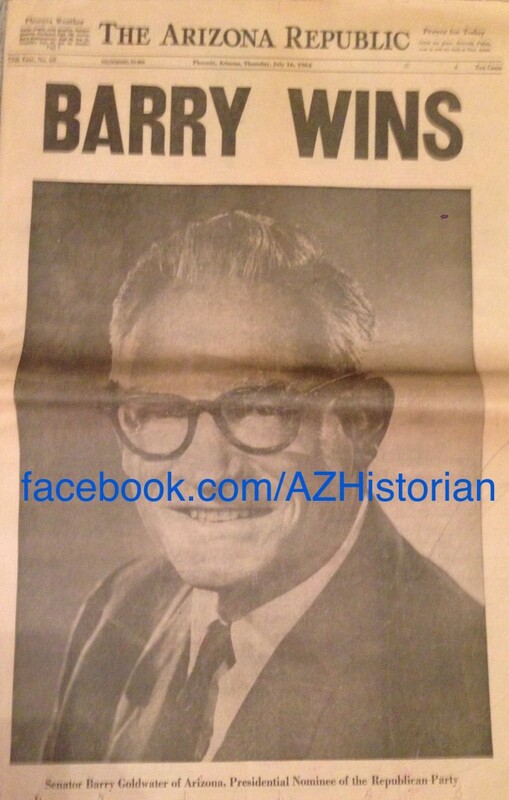 The front page of the July 16th, 1964 Arizona Republic featured a headline exclaiming, “Barry Wins,” referring to Goldwater having captured the 1964 Republican presidential nomination the day prior. Barry Goldwater accepted the Republican presidential nomination fifty years ago this evening. Goldwater, a Phoenix businessman who had served on the Phoenix City Council and, at the time of his nomination, was completing his second term in the United States Senate, secured his party’s nod after having prevailed over Nelson Rockefeller and William Scranton, two well-funded moderate Republicans from populous East Coast states. However, Goldwater’s convention victory would prove to be the pinnacle of his 1964 electoral success. The 1964 election occurred less than one year after the assassination of President John F. Kennedy, and American voters were disinclined to support yet another leadership transition. Goldwater’s strong conservatism and recent vote against the Civil Rights Act did little to endear him to voters in many parts of the nation. President Johnson’s campaign capitalized on widespread perceptions of Goldwater being a war hawk, an effort best represented by the infamous “Daisy Ad,” a controversial television advertisement that ran just one time but nonetheless managed to strongly reinforce the narrative of Goldwater being willing to recklessly over-escalate military conflicts such as the U.S. effort in Vietnam. These factors, paired with other issues such as the tepid support Goldwater received from moderate “Rockefeller Republicans,” resulted in a resounding general election defeat in which the Arizonan won only his home state and a handful of others. However, Goldwater’s campaign, supported by articulate political conservatives such as Ronald Reagan, helped to redefine conservatism and drastically alter the American political landscape. Goldwater, known by many as “Mr. Conservative,” went on to represent Arizona in the Senate for three more terms before retiring to his Paradise Valley home in 1987. An iconoclast to the end, Goldwater continued to speak his mind and gleefully rankle feathers — including those of his fellow GOPers — for the remainder of his life, which ended in May of 1998. To view of one Senator Goldwater’s ads featuring the candidate, please visit http://www.livingroomcandidate.org/commercials/1964/we-will-bury-you. To view President Johnson’s “Daisy Ad,” please visit http://www.lbjlib.utexas.edu/johnson/media/daisyspot/. To view a Goldwater ad featuring Ronald Reagan responding to claims of Goldwater’s hawkish nature, please visit http://www.livingroomcandidate.org/commercials/1964/ronald-reagan. Please note that the webpages on which the above links can be found are not operated by or endorsed by John Larsen Southard. Links are provided for educational purposes only.